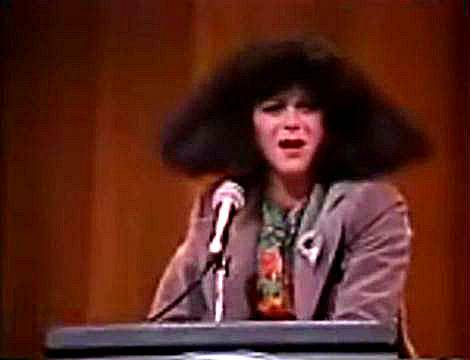 One of Gilda Radner's most memorable characters was Roseanne Roseannadanna, who appeared on "Weekend Update" in the early seasons of Saturday Night Live, which aired on the NBC network. She was the segment's consumer affairs reporter who, like an earlier Radner character Emily Litella, editorialized on current issues. Unlike Litella's meek and apologetic character, Roseannadanna was brash and tactless. The character was based on Rose Ann Scamardella, a former anchorwoman on WABC-TV's Eyewitness News in New York City. The character also appeared later in Radner's live one-woman shows. Today's video clip is a hilarious commencement speech Roseanne gave to the graduates of the Columbia School of Journalism. Taken from us much too soon. Magnificent!